Timur’s empire collapsed when he died in 1405 AD. Then the Mongols lost control of India for a while. Local Muslim leaders formed small states in northern India. But a generation later, Mongol leaders invaded India again and forced the Indians into a new empire, the Mughal Empire. Mughal is actually just an Indian spelling of Mongol. 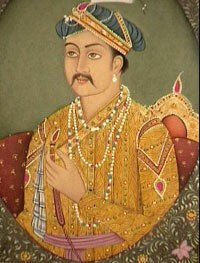 The first Mughal emperor was Babur (the original of the elephant Babar in the stories! ), who was one of Timur’s great-great-great-grandsons. Like Timur, Babur was a Muslim. 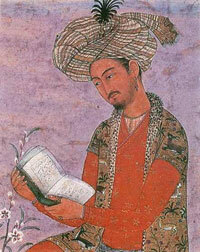 Babur ruled Kabul (in modern Afghanistan), and in 1504 he decided to reconquer Tamerlane’s old land in northern India. By 1526 AD, Babur used his advanced gunpowder weapons to capture Delhi, and ruled a large empire, just as to his east the Ming Emperors ruled China, and to his west the Safavids ruled Iran. When Babur died in 1530, his son Humayun took over. But the Indian people rebelled against him, and Humayun had to hide out with his friend Shah Tahmasp at the Safavid court. Just as Humayun was beginning to win back his empire in 1545, he died, leaving his general Bairam Khan and his widow, Hamida Banu, to rule for his 13 year old son Akbar. In 1560 Akbar grew up and he and Hamida Banu pushed Bairam Khan out and took power, just as Elizabeth I was ruling Britain at this time, Catherine de’ Medici was ruling France, and Chand Bibi was ruling in the Deccan Sultanates of central India. Hamida died in 1604, and Akbar died the next year, leaving a powerful Mughal empire covering all of what is now northern India, Pakistan, Afghanistan, and Bangladesh. 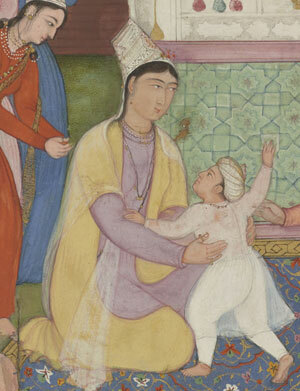 Akbar’s son Jahangir took power in 1605, though Jahangir’s wife, Nur Jahan, may have held most of the power. They lost the city of Kandahar (in southern Afghanistan) to Abbas, the Shah of the Safavids in Iran. This loss ended Mughal control of the Silk Road in Central Asia. But Nur Jahan also took over more of North India. In 1613, when Spanish sailors captured a Mughal ship carrying a lot of Muslim pilgrims on the hajj to Mecca, Nur Jahan arrested all the Spanish traders in the Mughal empire, and confiscated Jesuit churches. At the same time, Abbas was pushing the Spanish out of Iran and Bahrain. 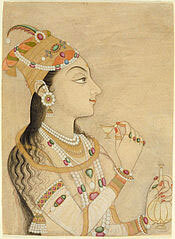 Near the end of Jahangir’s life, when he was sick, Nur Jahan struck coins in her own name. Nur Jahan tried to build an alliance between herself and the Ottoman queen Kosem Sultan and the Uzbeks against her enemies the Safavids, but Jahangir died in 1627 before the alliance could attack. Cite this page: Carr, K.E. Who were the Mughals? The Mughal Empire – History of India. Quatr.us Study Guides, July 19, 2017. Web. April 20, 2019.